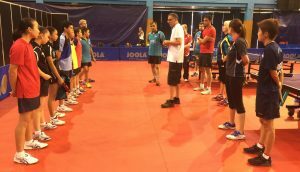 Commencing on Friday 13th and concluding on Friday 20th October, supported by the Foundation for Global Sports Development, a Hopes Training Camp recently took place in Fiji; the event preceding the beginning of the official ITTF World Cadet Challenge Training Camp. Hot and humid conditions greeted the young Hopes players at the Suva Vodafone Arena, getting ready for the prestigious event. At the recent ITTF World Hopes Week and Challenge the top four girls and four boys taking part were selected based on global reach and universality. The 2017 Hopes Team is composed by athletes and coaches coming from 11 countries and all continents. Head Coach Dejan Papic conducted the daily training sessions both on morning and afternoon, a total of six hours per day. Although the number one goal of the programme is to encourage National Associations to run talent identification programs, the push for the growth of young talented players comes hand in hand with coach education. Dejan Papic was the expert in charge of coach education and all throughout the week, group and individual mentoring took place, with a focus on players’ analysis and training periodisation. Key themes for the future work of the coaches with their players. The Hopes players were asked to define the key elements they wanted to improve during the training camp. First and second position in the recent 2017 World Hopes challenge Zhou Jingyi and Tayler Fox provide some interesting insights on the goals they set up for the camp. At the conclusion of the camp ITTF Education and Training emphasises that this is not the end of the road for these young talented players. ITTF has setup a comprehensive development pathway and will keep close contact with the participants, both athletes and coaches, and respective national associations, trying to encourage and mentor them to further develop in their table tennis and future careers. Stage one of the itinerary completed successfully. Heads up. World Cadet Challenge Training camp in sight.